From the day he was five-years-old and dropped off at his foster home of the next eleven years, Steve Pemberton’s days are filled with loneliness, fear, uncertainty and trauma. Along the way, through small acts of kindness from a neighbor that fortuitously included a box of books, Steve decides to fight in whatever way he can. Against all odds, he succeeded, graduating college and becoming a wildly successful and revered global corporate C-suite executive whose worked with the likes of iconic tech innovator Monster.com—one of the 10 largest businesses in the world, Walgreens, and now with social engagement leader Globoforce. One of America’s most inspiring executives, Steve has shared his powerful story and moved millions. This across social media and at more than 250 events he’s presented with for some of the biggest organizations in the world, including IBM, AT&T, Nissan, Southwest Airlines, United Way, National PTA, Boys & Girls Club, and J.P. Morgan. Indeed, Steve’s story is one of conquest, detailing how he overcame seemingly insurmountable odds to grow into a man of resilience, determination, and vision. So compelling is his experience, a feature film based on his top-selling autobiography—“A Chance in the World: An Orphan Boy, a Mysterious Past, and How He Found a Place Called Home” (Thomas Nelson, Paperback)—has been turned into a major motion picture distributed by Cinemark, which debuted nationwide in over 1,000 theaters on May 30, 2018. The book and film recounts Steve’s hurts and despair, but also his triumph against daunting obstacles. It’s a heart-wrenching but uplifting story of the human spirit’s ability to find hope, strength and forgiveness in the darkest of times, which readers are often moved to share with their family, friends, and neighbors. Starting December 1, 2018, the film available as a digital release via On Demand on local cable providers including Verizon, Xfinity, Direct TV and Time Warner. The movie is actually based on the now revised and expanded edition of Steve’s celebrated book,” in which his story is further elaborated upon with fresh reflections that have left so many readers forever changed. This moving account spotlights a young man’s determination to move forward in life, inspiring us all to reflect on the current, problematic state of the American Foster Care system. In kind, Steve is also working to give hope and a future to kids living in “the system” around the country. He’s is parlaying his success to “pay it forward”, having established the Chance in The World Foundation to help the tens of thousands of kids in today’s American foster care system get their own fighting chance. Through learning videos, workbooks, live and online coaching sessions, internship and externship opportunities with organizations and more, Steve is making a real difference. 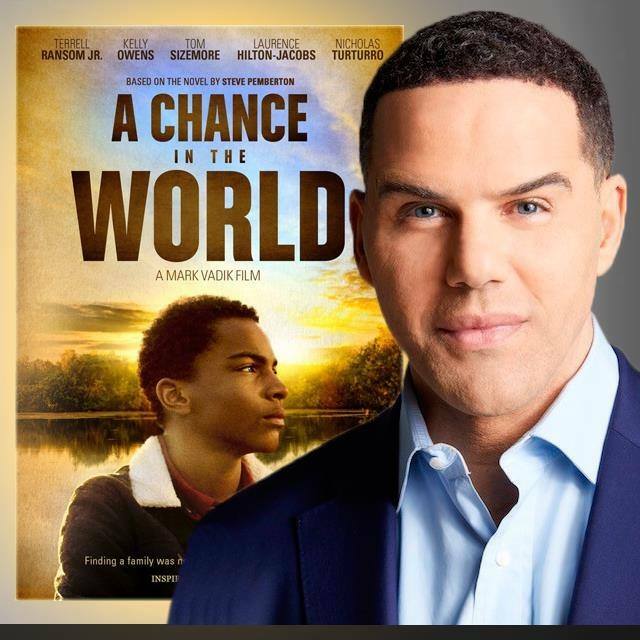 Ultimately, Steve Pemberton’s story is about defying seemingly insurmountable odds to become a trail-blazing corporate executive, empathetic leader, visionary youth advocate and acclaimed speaker. His best-selling memoir, A Chance in the World, recounts his triumphant life journey and drive to become a man of resilience, determination, and vision. Now an upcoming major motion picture, A Chance in the World further amplifies Steve’s highly motivational messages: Belief in your dreams, rise above obstacles, create opportunities for others, and most of all, persevere. Branding, business and entrepreneurship success pundit, Merilee Kern, MBA, is an influential media voice and lauded communications strategist. As the Executive Editor and Producer of “The Luxe List International News Syndicate,” she’s a revered trend expert and industry voice of authority who spotlights noteworthy marketplace change makers, movers and shakers. Merilee may be reached online at www.TheLuxeList.com. Follow her on Twitter here: http://twitter.com/LuxeListEditor and Facebook here: www.Facebook.com/TheLuxeList. Some or all of the accommodations(s), experience(s), item(s) and/or service(s) detailed above may have been provided or arranged at no cost to accommodate this review, but all opinions expressed are entirely those of Merilee Kern and have not been influenced in any way.